A century ago, craftspeople spent endless hours doing intricate work on the exterior of buildings that is seldom replicated today. So, when an old structure such as a museum, library, or brick apartment complex needs restoration, many people believe it will be impossible to reconstruct portions of the original façade or match it exactly without spending a lot of money, especially since colors of brick and mortar change and fade over time. But Raymond James Restoration Inc. of Worcester and Springfield has been debunking that notion for 15 years. “Restoration work is an art, and a lot of projects can be expensive. But restoration is all we do and because of our background, experience and knowledge, our repairs match so well no one ever knows they were done,” said Raymond James Simoncini, who founded the business. He added that although perfect matches take extra time, the company’s well-honed methods allow them to complete projects at reasonable prices. Details are important to Simoncini, and like the craftsmen of yesterday, he has dedicated his career to restoring buildings to their former grandeur so people can continue to enjoy their original beauty for generations to come. Simoncini grew up in the construction business and sharpened his skills under the tutelage of a dedicated mason who had taught the craft at a vocational high school and loved restoration work. Since that time, he has gone from working for others, to operating a one-man operation, to managing a business which employs eight people with services that range from masonry restoration of building facades, to historic revitalizations, to the many aspects of masonry repair, masonry cleaning and protection services, and maintenance consultation services. His roster of services also encompasses concrete precast repair and replacement and waterproofing coating and painting. The majority of the work is done in the commercial arena. Currently, the company is engaged in the first phase of a project on one of the buildings that make up Stockbridge Court in Springfield. “It’s made of concrete, and some of the material was falling off,” Simoncini explained, adding that water had seeped in behind the façade. The job involves treating the steel frame, which has rusted, and re-coating the entire structure with waterproof paint. Simoncini’s introduction to the construction business came at a young age when he began working for his father. He studied business in college, and although he continued working for his dad, he began taking on jobs of his own. In time, he was hired by a masonry-restoration company whose work included many high-end projects in Boston, on Newbury Street, Beacon Street and Commonwealth Avenue. During that time, Simoncini gained two clients who had so much for him to do, the time he spent on their projects soon equaled the 40 hours he was putting in at with his employer. When the firm’s business began to slow, Simoncini did some work for other companies, as he had joined the local mason’s union. But at age 24, he made the decision to go into business himself, and quickly became extremely busy due to word-of-mouth referrals, which to this day is how he gets most of his work. “I can find any brick and make it look old, and can match any mortar in a wall,” he said, adding that his company has doubled the amount of work it has done each year for the past three years. Simoncini has never shied away from a challenge, and has faced many during his career. A good example is the historic Edgell Memorial Library in Framingham, which was built in 1872 to commemorate the service of Civil War soldiers. The slate roof was being replaced, and that meant the library’s two stone chimneys needed to come down and put back up exactly the way they had been built. Another assignment that came complete with a number of challenges was the courtyard of the Rhode Island Federal Courthouse, where some of the pillars needed brick-replacement work. Simoncini explained that water had gotten between the bricks and the steel supporting rods and had pushed the bricks out. In order to get an exact match for 300 bricks, he purchased 1,600 so he could carefully pick and choose among them. “When you order bricks, they come in cubes of 500, and the shades are different colors,” he explained. His company also did brick-replacement, repointing, and sealant work on the Student Union at UMass Amherst. “The sealant was challenging because we were removing mortar in between the capstones and replacing it with the sealant and it had to match the original mortar that we removed. But the project engineer for UMass told us it was the best caulking job he had seen during his career,” Simoncini recalled with pride. By utilizing its own team members, Raymond James Restoration is able to control quality as well as project timelines and budgets, since it doesn’t have to wait for subcontractors, which means there no scheduling delays. 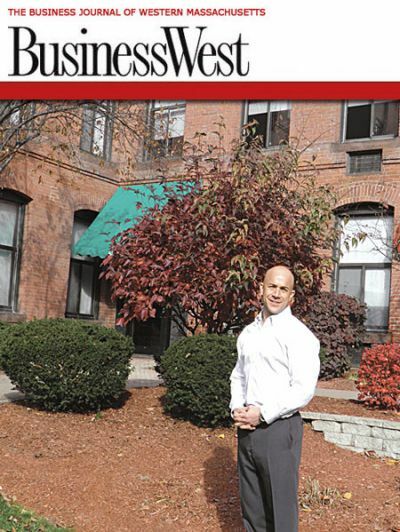 And although Simoncini said he could choose to take on more-costly projects in large cities such as Boston, his goal has always been to use his expertise to restore old buildings at rates that people could afford — providing a perfect match even when others have said it cannot be done. And that has helped him cement a reputation that is, well, rock solid.